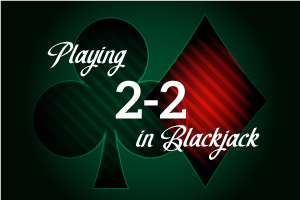 Two 2s doesn't look like an exciting hand at first glance. In fact, when I first began playing Blackjack, my first reaction to receiving this hand was always “what the heck am I going to do with a 4?” But two 2s is far from a just a 4. It is a combination that you can sometimes manipulate into a winning hand. How do you do this when 4 has a negative return across the board? The answer shouldn't be that surprising: you split. But you must be careful under which circumstances you do split, for there is a right and a wrong time in which to do so. Splitting 2-2 gives you a positive return when the dealer has 4 through 7 exposed ranging from $0.01 to $0.23 for each dollar invested. You definitely want to split on these hands. When the dealer is showing a 2, there is a negative return of $0.08. Compared to the negative return of $0.11 when hitting, splitting is the lesser evil in this instance. For 3, the return is -$0.02, as compared to hitting's -$0.08. Again, splitting is the best option. When the dealer is showing 8 through A, the story is different. If you split this hand, you will receive a -$0.18 to -$0.51 return. When you hit, the return is a negative $0.16 to $0.29 per dollar invested. Hitting on 8 through A is your best option. In review, with 2-2, you split when the dealer is showing 2 through 7, and you hit on 8 through Ace.